Pack your luggage, get your passports and be ready for a fascinating trip filled with exotic flavor. Be ready to be enchanted, because tonight we are invited to the Arabian Nights for a delectable feast, enjoyed around a cup of mint tea with Fairouz’s magical voice as musical background. For this Monthly Mingle, I decided to go with an individual and more elegant version of the famous pie known as Bastilla. 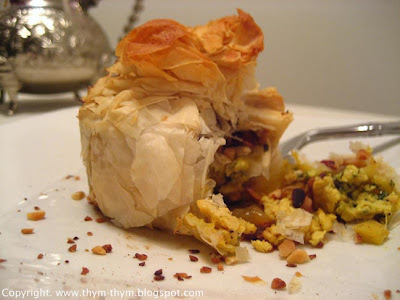 Bastilla or Pastilla is a Moroccan dish made traditionally of pigeon or squab, cooked with spices and layered with almonds and a thin pastry known as Ouarka. 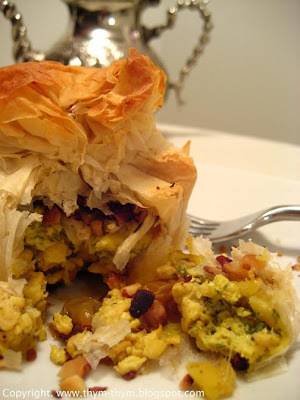 However, ground chicken can be used as a substitute for the pigeon, and the Phylo pastry for the Ouarka. Although the recipe calls to use meat, many versions are made throughout the world using only nuts with an egg filling and spices, or only nuts, honey and spices such as ginger, coriander and cinnamon. The filling can be made a day ahead and chilled overnight. Everything has to be ready when assembling the pie. Don’t forget to always keep your phylo dough covered by a damp kitchen cloth otherwise it will dry out easily. All the ingredients have to be at room temperature before assembling, so the phylo dough will not tear up with the steam. To serve, dust the Bastilla with cinnamon and icing sugar, which I forgot to do. You can either make an individual version of Bastilla like I did or the traditional version, which is to use a round pan. This dish is very versatile, so feel free to play with it. - 2 tbsp butter plus 3 tbsp of melted butter for brushing. Heat the oil and the butter in a large pan. Add the chicken pieces and brown for about 4 min. Add the onions, ginger, saffron, raisins, ½ tsp of the cinnamon and enough water (about 1 ¼ cups) so that the chicken braises, rather than boils. Season with salt and pepper. Bring to a boil and then cover and simmer very gently for 45min or until the chicken is tender and completely cooked. Meanwhile, toast the almonds in a small pan until golden and set aside. Transfer the chicken to a plate and discard the skin and bones and shred the flesh. Stir the chopped coriander and parsley into the pan and simmer the sauce until thickened. Add the beaten eggs and cook over a gentle heat until lightly scrambled. Add the chicken pieces to the sauce and stir to combine. Preheat the oven to 350F. Oil the muffin pans generously. Cut the phylo sheets in two rectangles. Place 4 phylo sheets in the bottom of the muffin pan so that it is completely covered and let the edges of the pastry sheets hang over the sides. Brush lightly with the melted butter and place the chicken and eggs mixtures on top and spread evenly. Place a single layer of a round phylo sheet. Brush once again with some melted butter and spread the almonds over. Sprinkle with some cinnamon and icing sugar. Fold the edges of the filo over and wrap the edges as shown on the picture. Brush with some butter. Continue as before with the rest of the chicken mixture and phylo sheets and bake the parcels for about 20 min, until the pastry is crisp and golden brown. Remove from the pan and dust some cinnamon and icing sugar on top. Serve hot or warm. Faites chauffer l’huile et les 25g de beurre dans une poele. Faites dorer les cuisses de poulet pendant 4 min. Ajouter les oignons, le gingembre, le safran, les raisins, ½ c.c de canelle et couvrir de 300ml d’eau. Saler, poivrer. Porter a ebulition, couvrir et laisser fremir sur feu doux pendant 45 min, jusqu'à ce que le poulet soit cuit. Entre temps, faites dorer les amandes dans une poele et mettre de cote. Mettre le poulet dans une assiette. Jeter les os et la peau et emietter la chair du poulet. Melanger la coriandre et le persil a la sauce et laisser fremir jusqu'à ce qu’elle epaississe. Ajouter les œufs battus et melanger sur feu doux jusqu'à ce qu’ils soient legerement brouilles. Ajouter les morceaux de poulet a la sauce et laisser refroidir. Prechauffer le four a 180C. Huiler les moules a muffin. Couper les feuilles de filo en deux rectangles et tapisser le fond des moules de 4 feuilles de filo. Prenez soin de laisser les feuilles deborder des moules. Les badigeonner de beurre fondu. Garnir le fond du melange de poulet. Ajouter un petit rond de feuille de filo badigeonne de beurre fondu. Mettre les amandes dessus. Saupoudrer d’un peu de canelle et de sucre glace. Rabattre les feuilles de filo sur les amandes et les fermer comme sur la photo. Badigeonner encore une fois l’exterieur de beurre fondu. Continuer comme il a ete montre precedement pour les autres moules a muffin restants et faire cuire pendant 20 min, jusqu'à ce que les petits sacs soient bien dores et croustillants a l’exterieur. Demouler, saupoudrer de canelle et de sucre glace et servir chaud ou tiede. Well, these certainly are lovely! They must be wonderfully fragrant as well with all of those delicious spices! Quelle beel pastilla! Je suis allee chercher dans les recettes de famille pour Meeta et j'ai finalement appeler ma mere car je n'arrivais pas a lire le melange arabe-francais de mon grand pere! Tu me donne bien faim! Incredible. I love the presentation! Very creative and incredibly aromatic. Thank you for the entry. - Thanks Susan. You are right, they are a real treat for the palate. - Merci beaucoup Helene. J'ai hate de voir ce que tu vas preparer. - Thank you very much Meeta. It was my pleasure. quelle belle pastilla Rose ! Ps : as tu reçu mes emails ? ele est magnifique cette pastilla et sûrement délicieuse bravo ! - Merci beaucoup Oumsohayb pour ton gentil commentaire. La Pastilla etait un vrai regale. Those are beautiful and must be wonderful to smell cooking in any kitchen. Excellent! 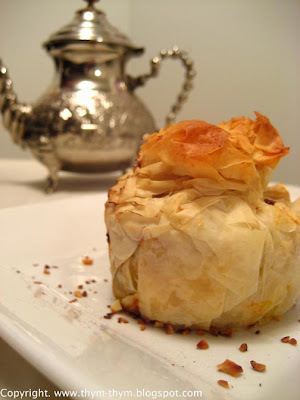 I just wrote about how much I love bastilla on my food blog! Thanks for stopping by my travel my blog! I had to check out your North African category, because this os one of my favorite types of cusines! Beautiful! Stop by my food website if you get the chance!